Even as Greece desperately tries to avoid defaulting on its debt, American companies are preparing for what was once unthinkable: that Greece could soon be forced to leave the euro zone. JPMorgan Chase, though, is taking no chances. It has already created new accounts for a handful of American giants that are reserved for a new drachma in Greece or whatever currency might succeed the euro in other countries. Stock markets around the world have rallied this summer on hopes that European leaders will solve the Continent’s debt problems, but the quickening tempo of preparations by big business for a potential Greek exit this summer suggests that investors may be unduly optimistic. Many executives are deeply skeptical that Greece will accede to the austere fiscal policies being demanded by Europe in return for financial assistance. FMC, a chemical giant based in Philadelphia, is asking some Greek customers to pay in advance, rather than risk selling to them now and not getting paid later. It has also begun to avoid keeping any excess cash in Greek, Spanish or Italian bank accounts, while carefully monitoring the creditworthiness of customers in those countries. “It’s been a very hot topic,” said Thomas C. Deas Jr., an FMC executive who serves as chairman of the National Association of Corporate Treasurers. Members of his group discussed the issue on a conference call last Tuesday, he added. American companies have actually been more aggressive about seeking out advice than their European counterparts, according to John Gibbons, head of treasury services in Europe for JPMorgan Chase. Mr. Gibbons said a handful of the largest American companies had requested the special accounts configured for a currency that did not yet exist. BAH! Greece should pull an Iceland and tell the banks to go hmmph themselves. If American banks and large companies are doing this so openly it is reported in the New York Times what does that say? No confidence and that they are betting Greece will go down. Earlier today we casually wondered whether the US stands to lose more by supporting China or Japan in their escalating diplomatic spat, considering the threat of a US Treasury sell off is certainly not negligible, a dilemma complicated by the fact that as today's TIC data indicated both nations own almost the same amount of US paper, just over $1.1 trillion. In a stunning turn of events, it appears that China has taken our thought experiment a step further and as the Telegraph's Ambrose Evans-Pritchard reports, based on a recommendation by Jin Baisong from the Chinese Academy of International Trade (a branch of the commerce ministry) China is actively considering "using its power as Japan’s biggest creditor with $230bn (£141bn) of bonds to "impose sanctions on Japan in the most effective manner" and bring Tokyo’s festering fiscal crisis to a head." I.e., dump Japan's bonds en masse. Should this stunning recommendation be enacted, not only would it be the first time in world history that insurmountable credit is used as a weapon of retaliation, it would mark a clear phase transition in the evolution of modern warfare: from outright military incursions, to FX wars, to trade wars, culminating with "bond wars" which could in the span of minutes cripple the entire Japanese fiscal house of cards still standing solely due to the myth that unserviceable debt can be pushed off into perpetuity (as previously discussed here). Well its October and despite all our expectations, and the frequent media reports about this or that country being on the brink, so far, so good! The economy may be in deep do-do, but as yet no-one has crashed out. Maybe though I am speaking too soon?? Lets hope you're not speaking too soon Simon, if any one Country crashes I am afraid it will start a big snowball, here in Canada we are in pretty good shape but if our neighbours to the south stager or falter at all we will feel it this side of the boarder. Athens, Greece (CNN) -- German Chancellor Angela Merkel expressed solidarity with Greece Tuesday on a trip to Athens, even as tens of thousands of Greeks rallied to show their anger toward her over the hardship their country is suffering. Critics see Merkel as the main enforcer of the European Union-imposed austerity measures that have left a large number of Greeks unemployed and streaming to soup kitchens for a hot meal. Police estimate as many as 25,000 people turned out to demonstrate in central Athens, despite a ban on protests in certain areas amid beefed-up security for Merkel's six-hour visit. Merkel, who arrived in Athens Tuesday for her first visit in several years, spoke of Greece as a partner and a friend to Germany as she addressed reporters with Greek Prime Minister Antonis Samaras. Merkel noted that Greece was going through a "very difficult phase" in which many people were suffering, but insisted the debt-stricken nation had already made progress in reducing its deficit and passing reforms. "It's for this reason that I would like to say that a huge part of the journey has already been accomplished," she said. The two nations "are going to work very closely together," she added, as fellow members of Europe and the euro. Samaras, whose government is seeking new ways to implement budget cuts of 11.5 billion euros ($14.49 billion) to ensure the country receives another international bailout installment later this month, also stressed the strong ties between the two nations. So Iceland decided not to follow the rest of the world by bailing out the bankers. Instead, they chose to arrest them. Now their economy is recovering faster than the EU and the United States. Hmmmm. Remember when the United States government told the American people that immediate action was required to save the banks, and save our nation from complete collapse? An action in the form of Billions of dollars of National Debt? Yeah, we remember that! Now Trillions of dollars in National debt later, we are in the same position we were in 4 years ago, just more debt. As a matter of fact Federal Reserve Chairmen Ben Bernanke has called for yet another stimulus that will add more debt onto the mountain we already have. At the start of the world wide 2008 economic collapse, Iceland was in worse shape than almost any other country in the world. Now they are one of the fastest growing economies in the world. Imagine what America would be like today if we bailed out the victims of poor banking practices, while punishing the bankers who were responsible? Pretty good contrast in stories, don'tcha think? Mark my words the US will NOT arrest the Skanksters, er um I mean Bankers. The United States is far too corrupt, unlike the Finland..
With about a quarter of the Spanish workforce (and half of the youngsters) unemployed many Spanish families are no longer able to afford to buy sufficient food. Therefore, in an unprecedented move (for the present era) the Spanish Red Cross has started appealling for funds to feed starving Spaniards. L2L, all I can say is "We Shall See" Of course it would be better if no country was to crash. The US is such a large economy that if it were to falter then half the planet would find itself in severe trouble. Canada and Mexico would likely find themselves inundated with economic refugees. Blue, so German Chancellor Merkel visited Athens to show solidarity with the Greek people and help reassure them that Germany and the EU will do as much as it possibly can to prevent Greece from having to leave the Eurozone. A cynical point of view would be that when a top politician starts making “all the right noises” about supporting others who are in trouble then it means that a ‘precipitous event’ might be near! With Greece poised to receive yet another bailout - but needing to make further cuts to be eligible, plus Spain on the brink of seeking a bailout and several other countries also still in deep trouble so is the derailed train going to avoid the buffer stop and rock wall behind it by (instead) toppling down the embankment? Or will the bankers somehow cobble together a deal which avoid total financial catastrophe - but leaves most ordinary people financially impotent? I have read online chatter about some sort of new financial settlement which will release funds held by certain wealthy organisations (whom? er, um, I’m not sure) which alongside some debt forgiveness will be used to repay many debts - so that everyone can ‘start again’... with THIS TIME the entire planet becoming wealthy, so that there will be no so called ‘third world’. This sounds like the post WW2 Marshall Plan, except that this time the entire planet will benefit, rather than just a few nations (with others, especially those in Latin America) being impoverished at the same time. Perhaps the elite have been biding their time? As I understand it, traditionally financial crashes (etc) occur around the autumn, especially September / October. Then again, what is said to be coming is expected to be a much more severe crash which will also be accompanied by global geophysical upheavals that afterwards will require much rebuilding, so with the present-day elite poised to be ‘taken out’ (probably already happened behind the scenes, but not in the public domain) the debt forgiveness and ‘start again’ scenario also seems possible. Not so cynical to me, Simon. That is exactly why I posted the article. And now the EU wins the Nobel Peace Prize? Something wicked this way comes me thinks. The British government has warned that the latest audit of Brussels spending "seriously undermines the credibility of the EU's financial management". British opposition to Brussels budget increases hardened on Tuesday after the EU's auditor failed to give a clean bill of health to £89 billion of spending "affected by material error". The European Court of Auditors reported on Tuesday that controls over 86 per cent of the EU budget last year were only "partially effective", a conclusion that has further polarised the battle over European Commission demands for a sharp rise in spending. In short, oodles of money is continuing to 'go astray' and it is now the 18th year that The European Court of Auditors has refused to give the EU's spending a 'clean bill of health'. An allied fact to this topic is that at a time when severe budgetary issues mean that most national governments are having to restrain their own spending the European Commission and European Parliament have defied calls for similar austerity measures at the EU level and instead want an 11% increase to long-term Brussels expenditure from 2014 to 2020! As this Financial Times article explains, http://www.ft.com/cms/s/0/797002de-2a95-11e2-a137-00144feabdc0.html#ixzz2BwhsOKqs because of rows over unpaid bills of 'at least' €9bn from this year, talks on the 2013 budget plan collapsed abruptly on Friday evening amid a clash between member states and MEPs . Apparently the EU budget commissioner had requested an €8.9bn amending budget to cover the shortfall – something which the the UK and other member states (eg: Holland and Germany) dismissed because it represented a whopping 9.5% increase in this year’s budget!!! – something that is deemed to be unacceptable. Questions could also be asked about the competence of the EU budget commissioner and his team, especially as he later admitted that €1bn of that money may not be needed until next year!!! The European Parliament wants an inflation busting increase of 6.8% for 2013's budget, whilst the governments of member states are saying that the increase should not be greater than the rate of inflation (ie: 2.79%). However, back in Britain he has been under much pressure over our contributions to the EU budget with many British people questioning the affordability of our membership of the EU which is seen as a bloated and financially irresponsible organisation that would benefit from a financial crisis. (CNN) -- A wave of anger over austerity is sweeping across Europe as workers fed up with government spending cuts and tax rises take to the streets in a coordinated day of action. Some of the largest protests are taking place in Spain, where a general strike is under way. Public transport has been shut down, or disrupted, while many schools, shops, factories and airports are closed. There have also been significant walkouts -- and outbreaks of violence -- in Portugal, Greece and Italy. Limited protests are taking place in other countries, including France and Belgium -- and even in Germany where the traditionally strong economy has taken a hit. Transport across the continent is being disrupted by the strikes. Hundreds of flights have been grounded, and there are severe reductions in intercity rail services and local transit systems. Protesters say the cuts will compromise livelihoods and increase unemployment. Clashes are reported to taken place between police and activists in various cities. The strikes have been called by the European Trade Union Confederation, which represents 85 separate organizations across the continent. "Austerity is a total dead end, and must be abandoned. Social protection and wages can no longer be sacrificed," it said on its website. "This is a social emergency, and it is time to listen to what the citizens and workers have to say, and to change course." One country refused to bail out its derelict banks and slash social spending amid the financial crisis. And guess what? Unlike the eurozone and the United States, it’s making a sturdy comeback. Iceland’s stock market plunged 90 percent in 2008. Inflation reached 18 percent, unemployment shot up ninefold and its biggest banks failed. This was no recession. It was a full-blown depression. Since then, the country has steadily improved. By September of this year, it repaid its IMF rescue loans ahead of schedule. Unemployment dropped by half and its economy will have grown by roughly 2.5 percent by the beginning of 2013. So what’s Iceland’s secret? According to the editors at Bloomberg News, it’s a refusal to do what virtually every other nation that was pummeled by the crisis did: adopt policies of economic austerity. Iceland’s approach was the polar opposite of the U.S. and Europe, which rescued their banks and did little to aid indebted homeowners. Although lessons drawn from Iceland, with just 320,000 people and an economy based on fishing, aluminum production and tourism, might not be readily transferable to bigger countries, its rebound suggests there’s more than one way to recover from a financial meltdown. Nothing distinguishes Iceland as much as its aid to consumers. To homeowners with negative equity, the country offered write-offs that would wipe out debt above 110 percent of the property value. The government also provided means-tested subsidies to reduce mortgage-interest expenses: Those with lower earnings, less home equity and children were granted the most generous support. Letting the losses fall on bondholders rather than taxpayers, maintaining the country’s welfare system and imposing temporary controls on investments protected Iceland from collapse and pushed it toward recovery, she said. American leaders are threatening to do the opposite at the end of this year when a potential failure to reach a deficit reduction deal will trigger a total of $54.7 billion in spending cuts from government offices and social programs, Medicare among them, per year. And all of this in a peaceful way. A whole revolution against the powers that have created the current global crisis. This is why there hasn’t been any publicity during the last two years: What would happen if the rest of the EU citizens took this as an example? What would happen if the US citizens took this as an example. 2008. The main bank of the country is nationalized. 2008. The citizens protest in front of parliament and manage to get new elections that make the resignation of the prime minister and his whole government. The country is in bad economic situation. A law proposes paying back the debt to Great Britain and Holland through the payment of 3,500 million euros, which will be paid by the people of Iceland monthly during the next 15 years, with a 5.5% interest. 2010. The people go out in the streets and demand a referendum. In January 2010 the president denies the approval and announces a popular meeting. In March the referendum and the denial of payment is voted in by 93%. Meanwhile the government has initiated an investigation to bring to justice those responsible for the crisis, and many high level executives and bankers are arrested. The Interpol dictates an order that make all the implicated parties leave the country. -referendum so that the people can decide over the economic decisions. Have we been informed of this through the media? Has any political program in radio or TV commented on this? No! 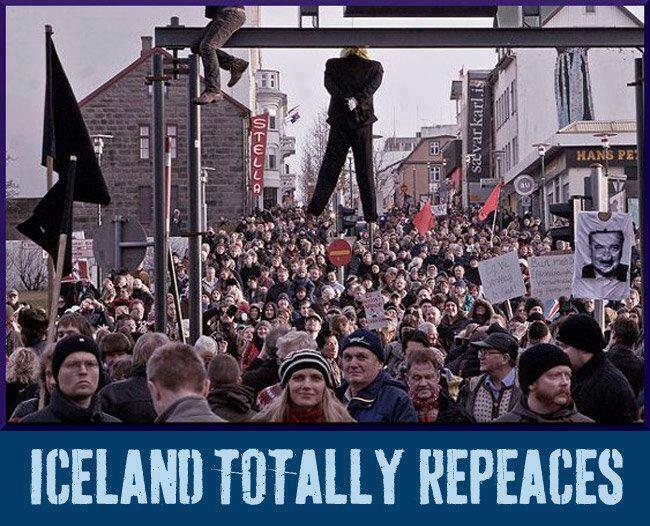 The Icelandic people have been able to show that there is a way to beat the system and has given a democracy lesson to the world. Please spread the news as Iceland is the role model now although sooner or later, the banksters will start demilishing their nationalized bank. The (Financial) End Of Britain?? According to an article in MoneyWeek magazine, we are facing the end of Britain. In short, our financials are so bad that we face financial Armageddon. The issue is debt. So, will the last person please switch the lights off as they leave. Admittedly they are trying to frighten people in to subscribing to their financial investment advice, but as we found out yesterday (Weds 5th Dec 2012) when the Chancellor of the Exchequer made his 2012 Autumn Statement, the economy is not going the way that had been hoped and the date for ending the age of austerity is receding off in the distance. This is the same load of horse doo doo conservatives are trying to sell the US. It's all the fault of the old folks and those lousy folks who are just too lazy to work and want to live off the largesse of the government. The same problem affects Great Britain and the US - the lack of revenue not expenses. US-based coffee giant Starbucks said Thursday that it will pay around £10 million in corporation tax in Britain in each of the next two years after lawmakers roasted the company for avoiding taxes. Kris Engskov, the managing director of Starbucks UK, made the announcement in a speech in London amid rising public anger in austerity-hit Britain at multinationals that fail to pay enough tax. “Today, I am announcing changes which will result in Starbucks paying higher corporation tax in the UK — above what is currently required by law,” Engskov said in the speech to the London Chamber of Commerce. He said that in 2013 and 2014 Starbucks would not claim tax deductions for “royalties or payments related to our intercompany charges”. “In addition, we are making a commitment that we will propose to pay a significant amount of corporation tax during 2013 and 2014 regardless of whether our company is profitable during these years,” Engskov said. Starbucks had previously confirmed that it did not pay any corporation taxes in Britain for the past three years on sales worth £400 million. Add in the amounts Google, Amazon and other multinational companies should pay and you will see a huge reduction in the debt. Who is the "welfare queen" now? Hmmm? Just who is it that benefits the most from these tax "breaks" given to profitable corporations? It sure isn't seniors, the disabled, children and the poor in general. 3.) Suspected Epilepsy from serious blows to the head! 4.) 5% PHYSICAL BRAIN DAMAGE from being bashed! Companies are the biggest welfare Kings and Queens! ask yourself this do you know how to live on $772 a fortnight PAY MARKET RENT, Plus water bill, plus electricity bill, plus pay TV, plus phone, plus Internet. FILTHY old DUST COATED Service (gas) station food for a F ING FORTNIGHT ***ON CREDIT*** that's out of date since 03/01/01 (MARCH 1st 2001) that just cost me $950 to pay back ANYONE!, SICK MUCH! How would you like to live out of a service (gas) station for a fortnight and have to crawl up the owners a$$ everytime you go down there just to eat for a fortnight.. Even though you feel like HELL in the process. I've never liked Starbucks and therefore always avoided them. I see them as being over-priced compared with some other coffee bars. But now, because of the tax situation there is a growing movement here in Britain for people to do this en masse. The amount they are volunteering to pay is derisory... to my eyes it would be better if they had not made this offer as it is so small as to make them look worse than before. As for Google, well the money I make from their Adsense advertising scheme is such that although the wolf is just outside it has yet to enter through the door (to coin a phrase). If they cut back on what they paid me then I could be in trouble. As the media and politicians often point out, none of the big three multinationals (Starbucks, Google, Amazon) are doing anything illegal. Its just that they have good accountants who know how to present a balance sheet in a way which best suits the interest of their employers. Offsetting profits against building works / other expenses in ways which minimise tax bills is normal practice. That said, I do agree that it is obscene for large multinationals to play legal 'financial games' and milk us here. They should be forced, through legislation if need be, (but - even better - through global international agreement) to pay domestic taxes on domestic profits. In every nation they operate. OK, an allowance could be made for people like Google who have server farms (placed in just a few locations globally) to pay for... but the International agreements could allow them to spread a fair portion of the cost of operating these server farms to each national operation. SYDNEY - Up to 233 billion barrels of oil has been discovered in the Australian outback which could be worth trillions of dollars, in a discovery that could turn the region into a new Saudi Arabia. The discovery in central Australia was reported to the stock exchange by Linc Energy, an energy company and was based on two consultants’ reports, though it is not yet known how commercially viable it will be to access the oil. The reports estimated that the company’s 16 million acres of land in the Arckaringa Basin in South Australia contain between 133 billion and 233 billion barrels of shale oil trapped in rocks. It is likely that only 3.5 billion barrels, worth almost $359 billion at today’s oil price, could be recovered. The find was likened to the Bakken and Eagle Ford shale oil projects in the US, which have resulted in massive outflows and led to predictions that the US could overtake Saudi Arabia as the world’s largest oil producer as soon as this year. Peter Bond, Linc Energy’s chief executive, said the find could transform the world’s oil industry, but noted that it would cost about pounds 200million to enable production in the area. Shale oil is more costly to extract than conventional crude oil and involves hydraulic fracturing, commonly known as fracking. This involves introducing cracks in rock formations by forcing through a mixture of water, sand at chemicals at high pressure. “If you took the 233 billion [barrels], well, you’re talking Saudi Arabia numbers,” Mr Bond told ABC News. “It is massive. If the Arckaringa plays out the way we hope it will, and the way our independent reports have shown, it’s one of the key prospective territories in the world at the moment. Oh my! Things are getting ready to change drastically in the land of Oz. LONDON - Britain's economy shrank more than expected at the end of 2012 with a North Sea oil production slump, lower factory output and a hangover from London's Olympics pushing it perilously close to a "triple-dip" recession. The country's gross domestic product fell 0.3 percent in the fourth quarter, the Office for National Statistics said on Friday, sharper than a 0.1 percent decline forecast by analysts. The news is a blow for Britain's Conservative-led government, which a day earlier defended its austerity program against criticism from the International Monetary Fund. It needs solid growth to meet its budget targets, keep a triple-A debt rating and bolster its chances of winning a 2015 election. Sterling fell to its lowest in 13-1/2 months against the euro and hit a five-month low against the dollar in response to the data. The euro was also buoyed by a stronger-than-expected German Ifo sentiment survey. Hmm, no Grexit, indeed no financial meltdown... although because of the financial situation many people are still suffering horribly. Europe - after marathon hours of negotiating - has agreed a long-term budget. For the first time in the EU's history there will be a real-terms cut in the budget. The total of 960bn euros (£812bn; $1.3tn) represents a 3% reduction from the previous seven-year deal. An ‘options trader’ has made a $11.25 million dollar ‘bet’ that something very bad will happen within the next 60 days. What does this person know that we don’t? According to this story from Business Insider, we all need to be very alert over the next two months. Stocks have been rallying relentlessly to post-crisis highs. Meanwhile, the volatility index (aka the VIX, aka the "fear index") is near historic lows. But according to UBS's Art Cashin, some options trader has made an enormous $11.25 million bet that the VIX will explode higher very soon. And a rally in the VIX is usually accompanied by a drop in the stock markets. The Government’s economic strategy has been dealt a serious blow after a leading credit ratings agency downgraded UK debt on its expectation that growth will "remain sluggish over the next few years". Moody’s announced on Friday night that it had cut the Government’s bond rating one notch from ‘Aaa’ – the highest possible level – to ‘Aa1’. The move is a significant setback for Chancellor George Osborne, who has faced criticism that his strategy for dealing with UK’s huge debt burden is failing to deliver. Moody’s pointed to “continuing weakness in the UK’s medium-term growth outlook, with a period of sluggish growth which [it] now expects will extend into the second half of the decade”. The credit ratings agency also noted that the Government's debt reduction programme faced significant "challenges" and that the UK's huge debts are unlikely to "reverse before 2016". Yes but its only one agency, and anyway now that the Italian election saw a protest political part that is led by a comedian won 25% of the vote so the media seems convinced that the whole Euro experiment will be in trouble again. Which would (potentially) be good for us Brits, seeing that we are outside the Euro. FRANKFURT (MarketWatch) -- Fitch Ratings on Friday cut Italy's sovereign credit rating to BBB plus from A minus, citing the inconclusive outcome of last month's parliamentary elections and a deeper recession. The outlook on Italy's rating is negative, the firm said, which means the country could see another downgrade. With Italian politicians scrambling to form a government, "increased political uncertainty and [a] non-conducive backdrop for further structural reform measures constitute a further adverse shock to the real economy amidst the deep recession," Fitch said, in a news release. Meanwhile, data indicate the country's recession may be deeper and more protracted than previously expected, Fitch said, causing Italy's debt to peak in 2013 at close to 130% of gross domestic product. Fitch previously forecast a peak of 125% in mid-2012. Making ordinary people pay for the mistakes of bankers in this way is so unacceptable that its worse than theft, its an act of war by the elite against ordinary people. So, where will be next? Maybe its time I looked again at my bank account?? I wonder how many other people are thinking likewise??? Savers race to ATMs as an unprecedented EU bailout of Cyprus demands all of them, including Brit ex-pats, pay a levy of up to 10%. Anyone with savings in a Cyprus bank will lose some of their money under a ground-breaking bailout deal agreed by European finance ministers. Bank customers will pay a levy of up to 9.9% on their savings, a charge which will raise nearly 6bn euros (£5.1bn). Cyprus is the fifth country to seek a bailout following Greece, Ireland, Portugal and Spain but the terms of the deal are a radical departure from previous schemes. Finance ministers have agreed to lend the indebted island 10bn euros but in return, the public will be forced to forfeit part of their savings. Savers with more than 100,000 euros (£86,500) in the bank will be charged a one-off levy of 9.9%. Those with less will be charged 6.7%. It will apply to everyone from pensioners to Russian oligarchs, who are alleged to have billions stashed away in what officials say is a bloated Cypriot banking sector. Private investors will also face a second hit under a "withholding tax" imposed on interest on bank deposits.